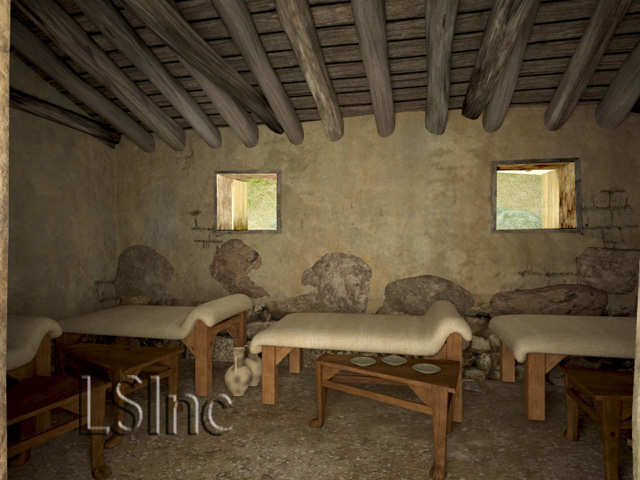 Learning Sites provides complete custom visualization services for your excavations, your fundraising, your coursework, your research, and your publications. What are archaeologist's goals--to develop and test hypotheses about ancient cultures by investigating its architecture and artifacts in context and the causes of inter- and intra-site change; to infer ancient behaviors; and to communicate the results of these investigations to others (colleagues, students, and the general public). In order to allow others to test similar hypotheses against the evidence, others need access to all of the evidence. Others should also be able to test hypotheses in ways that mimic (simulate) the possible ways past peoples actually lived and past events actually happened. We look forward to working with your data, providing you with new insight, as we have with dozens of your colleagues around the world. LEARNING SITES works with you to make hypothesis testing during excavation more efficient through our unique Digital Site SeerTM. 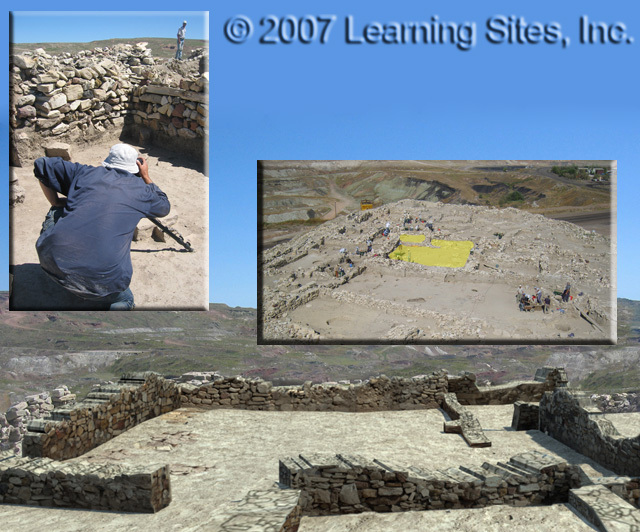 LEARNING SITES offers born digital excavation recording software, including tools for automatically generating interactive 3D models of artifacts, features, architecture, and trenches as your excavations progress (an example of the process in use at Seyitomer, Turkey, a few years ago; hover over the image to enlarge). For example, establish a digital link between your excavation and our model shop. You digitally record and transmit back to us survey data, daily trench progress, precise find spots, and detailed architectural information. We build 3D models of your remains, providing you with immediate feedback in the form of 2D and 3D images. Our innovative visualizations of your work help clarify excavation strategies while the dig proceeds and offer quick ways to test hypotheses about your site (used at sites in Israel, Turkey, and Italy). 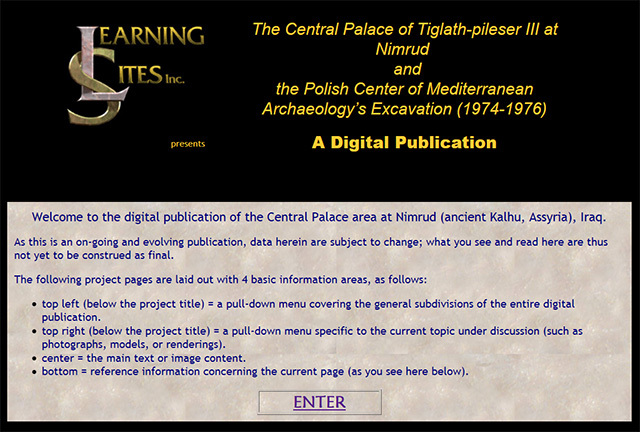 All-digital excavation recording and documentation software is also available for on-site integration among photographs, drawings, 3D models, and tabular data (e.g., the REVEALTM software package developed by our sister organization, the Institute for the Visualization of History, and used by many sites around the world). LEARNING SITES works with you to create dynamic teaching materials based on your fieldwork or your research. For example, your excavation data or project research can be turned into course supplements or entire educational packages through the addition of interactive virtual worlds, animations, and high-resolution 2D visualizations that we create under your supervision. In partnership, we can produce classroom materials using the most up-to-date information for the benefit of everyone in education. Find out more about your educational products and services by visiting the For Schools links above. 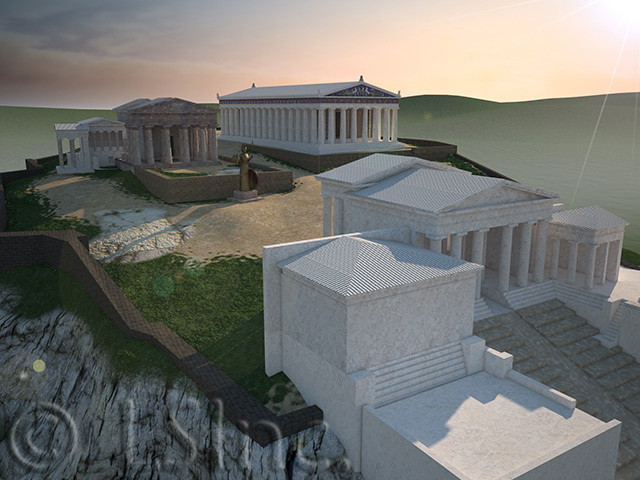 LEARNING SITES works with you to create archaeological analysis tools that use advanced computer graphics and that are tailored to your specific needs, re-creating the original ancient context of objects and architecture and helping you test hypotheses about the past (at left, a screen shot from our virtual reality re-creation of the Acropolis in response to hypotheses about the survival of the Old Athena Temple; hover over to enlarge). "[Learning Sites was] not to produce an illustration. The model's value resides in the same reasons why modeling is standard practice in schools of architecture: it provides means of checking information and, most of all, of visualizing what one has in mind. It was important to reckon with the visual impact of the archaic Temple upon the Classical structures surrounding it. 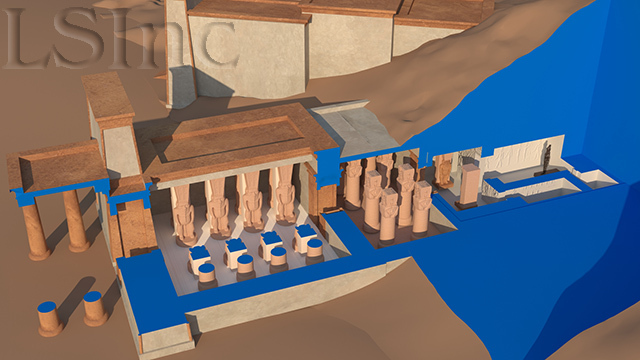 Most of all, accurate modeling that took into account all available data would reveal any existing evidence to refute the argument that the temple could not have stood in that location after the Persian invasion"(Gloria Pinney, 2006, about the benefits of 3D images). The past happened in 3D, so that's the way we should it. How better to test theories about a site, a building, or an event, than by reproducing the locations as an interactive computer model so that you can see the past through the eyes of ancient inhabitants? For example, choose a site or building and associated artifacts from your work. We'll reproduce them in a 3D computer model, re-placing the objects in an authentic, researched setting and will program the material for virtual reality. 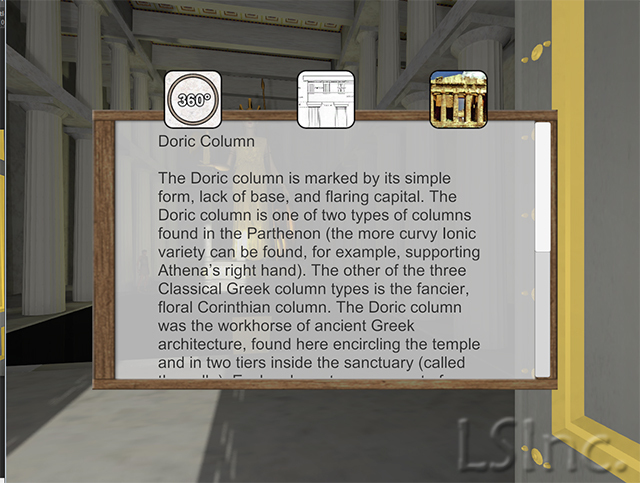 You'll be able to explore the site and its objects, move around them, and get a near firsthand experience of the place. You can ask questions that you never could about 2D images, :such as: How do the doorway locations affect how inhabitants moved through the spaces? or How would different lighting methods or window placement affect activities in various spaces? We will also link text and still images (or narrations) to objects in the virtual world, providing you and your colleagues with interactive and exciting research and study environments. LEARNING SITES works with you to produce innovative digital publications of your architectural or archaeological research, supplementing or supplanting traditional paper-based publications, for personalized interactive research. 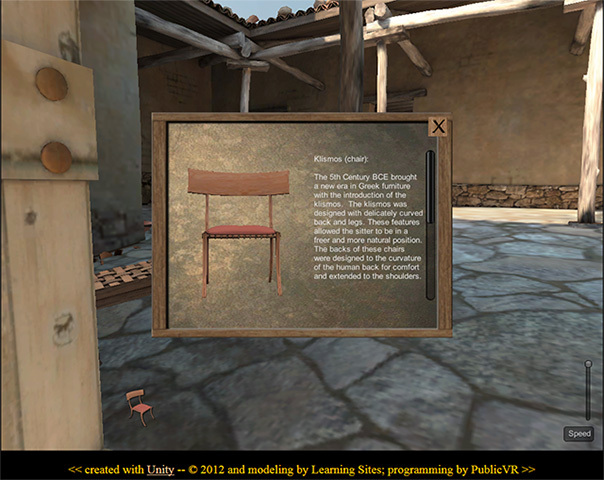 For example, an interactive 3D computer model can become a visual index to a publication, allowing users to walk through buildings or sites and select, with just a click, the artifact or architectural element about which they want additional information (such as inventory data, bibliography, drawings, your analyses, or field diary excerpts). Such a model, or a virtual world constructed from it, can also be used in the classroom, engaging students in an active learning experience. 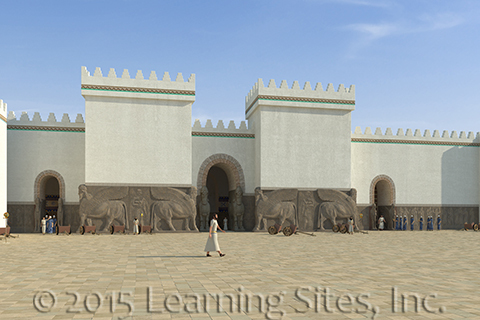 Northwest Palace of Ashur-nasir-pal II, Nimrud, Assyria (northwestern Iraq), digital publication and research resource. 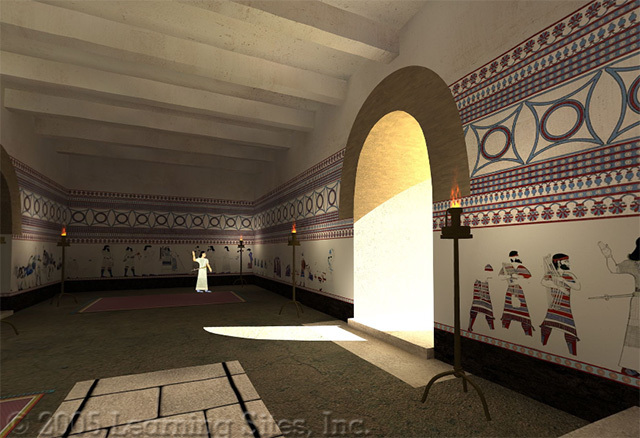 "I am particularly pleased with such virtual reconstructions, because I am able to visit a site and travel across it and see things that I could not see in one image before or even see easily and quickly if I were able to visit the [actual] site; and see spatial relationships the way the ancient Assyrians intended." (the late Samuel Paley, 2006, about our Northwest Palace re-creations). 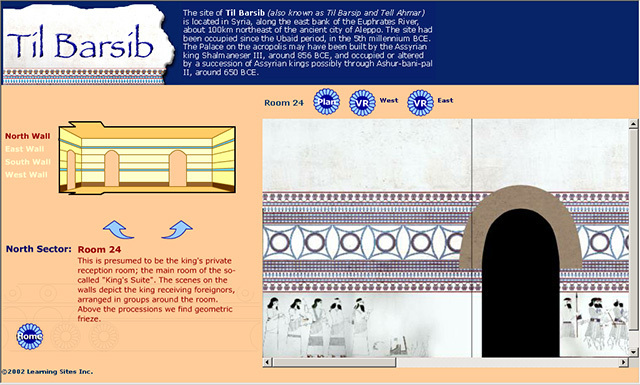 Jebel Barkal virtual reality-based digital excavation report and research resource. The Til Barsip educational package. LEARNING SITES helps to make the entire archaeological process (data retrieval, analysis, and dissemination) more efficient and effective. Digitize excavated materials as they are extracted, send the information back to our model shop where we'll turn around 3D models of the site, building, or assemblages to send back to you in the field to aid in redirecting or interpreting your excavation strategies. The same information can be placed on your excavation Website or in social media, if you wish, for instant feedback from colleagues, thus providing you with the most current evaluations and interpretations while you work. We will use the same digital data to provide you with stunning visualizations for teaching, publication, conference talks, and donor presentations. These are only a few of the possibilities afforded by a LEARNING SITES approach. None of these visualizations or tools has to stand alone; one department's application can be built to complement another's, providing an integrated solution to excavation, research, and teaching. Some of the institutions with whom we are worked, include: Harvard University; Texas A&M University; University of South Florida; Yeshiva University; St. John's College; University at Buffalo; Cornell University; Dumlupinar University (Turkey); Bryn Mawr University; Oriental Institute; Brown University; Dickinson College; Florida Atlantic University; Yale University. Tell us how our expertise might benefit your work. Contact us to become part of the growing LEARNING SITES global online bi-directional archaeological visualization and education network.